Drill a few shallow holes in to the tree stump and spread this product at 60 grams for every 10cm of stump width. Next cover the stump with a sheet of clear plastic, stapled to the sides or tied to keep the treated area waterproof. 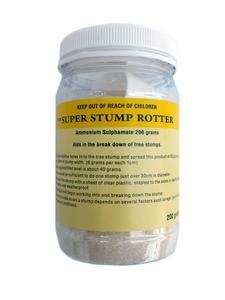 The product will begin working into and breaking down the stump.